The Garmin GPSMAP 60C contains many exciting features including - 256-colour TFT colour display screen, producing one of the brightest, sunlight-readable displays available. 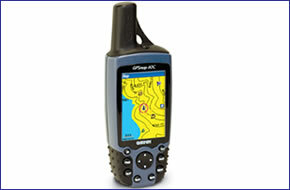 Accessories are still available for your GPSMAP 60c click here. With separate serial and USB interfaces. Detailed maps can be transferred to the unit using the USB interface. Navigation instructions can be shared with repeaters, plotters and autopilots using NMEA protocols through the dedicated serial port. The Garmin GPSMAP 60c also includes a built-in International basemap with auto-routing capabilities. Completely waterproof, the Garmin GPSMAP 60c has a battery life exceeding 25 hours, this new product is targeted to the marine and outdoor recreation markets. The Garmin GPSMAP 60C is fully compatible with MapSource products like BlueChart and CitySelect providing detailed streets for turn-by-turn guidance (there is no voice output) with 56MB built-in memory. The Garmin GPSMAP 60C encompasses a built-in trip computer, which provides odemeter, stopped time, moving average, overall average, total time, max speed and more. The Garmin GPSMAP 60C also includes a electronic compass that displays accurate heading while standing still. A barometric sensor with automobile pressures trend recording. Do you have a question about the Garmin GPSMAP 60c or other handheld GPS related question that's not been answered on this webpage? Please see our handheld and Outdoor GPS FAQs page for questions from other customers.Plus if the answer to your question isn't featured, use the online form to ask us for the answer. Alternatively please telephone 01733 777623 Monday to Friday (9:30am-5:00pm) to speak to one of our sales team. For further information online please see the Garmin GPSMAP comparison table. Looking for accessories and spares for the Garmin GPSMAP 60C? Many parts are available including a carrying case, retractable lanyard, vehicle power cable and dash mount. Question: I don't know whether you'll be able to help or not, but I have recently dug out my old Garmin GPSMAP 60c handheld module because my kids are looking to do some Geocaching. I only ever used it for Grid References, so I never really looked into the unit that much, and I'd like to try and put some maps onto the unit, but with it being so old, it's proving a little tricky to find any reliable information about what mapping is available for it online. Most sources tend to end up pointing me in the direction of 1:250,000 SD Cards, which are no good, because the 60c doesn't have a card slot, so I just wondered whether you could advise me on what mapping is available for my unit, and whether you can supply it? Answer: The short answer is that no hiking/walking/OS mapping is available for the Garmin GPSMAP 60 series. The longer answer is the TOPO maps that were compatible with the Garmin GPSMAP 60 series were discontinued around 2015 and replaced with GB Discoverer maps. The GB Discoverer series has since been replaced by the new TOPO series. Due to the age of the Garmin GPSMAP 60 series none of the GB Discoverer or new TOPO series maps are compatible with Garmin GPSMAP 60 series. You would need to buy a Garmin GPSMAP 62 series or later series for the maps to function. The bottom line to use maps for hiking/walking you would need to buy a later Garmin handheld device that is compatible. Question: Can you let me have a pricelist for spare parts for the Garmin GPSMap 60C? The rather thin stainless spring contacts for the battery box have fractured at the sharp bend that forms the spring. If you do not have a spare battery box, grateful if you can suggest any sites that may have other fix's to what I am told is a common problem with Garmin GPSs. Answer: The only parts we sell for the Garmin GPSMap 60C are listed on the GPSMAP 60C accessory page. We do not, and have never sold the stainless spring contacts. You will need to contact Garmin to see if they can assist you. Do you have a question about the Garmin GPSMAP 60C? Submit your question via our contact page.